Understanding how to take care of the Earth starts in childhood, when bees and butterflies are part of playtime. Jan “Gramma” Golden is a passionate environmentalist who maintains a garden that is not only a certified National Wildlife Federation habitat, but also an Audubon Bird and Butterfly Sanctuary. Inspired by her own passions, Golden has written a children’s book that has proven popular among educators and children alike. “Bird Lady Meets Mort and Ort in ‘It’s a Great Day for Pulling Weeds’!” takes kids on a whimsical journey through the Bird Lady’s garden. One day, while believing that she is taking care of her plants, she meets two zany birds named Mort and Ort who quickly teach her how to do a better job of helping wildlife visitors thrive in her garden. Through colorful illustrations, Golden’s book teaches children to appreciate their role in keeping the environment safe, and even includes easily digested explanations of current environmental issues like colony collapse disorder. 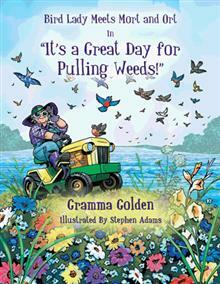 It is a book perfect for parents, teachers, and environmentalists of every kind. For more information, visit authorhouse.com. Gramma Golden is active in her community, having served as a nurse, teacher, and Board of Education volunteer. She is passionate about maintaining her gardens and loves the outdoors. She is married with two grown children and three grandsons.